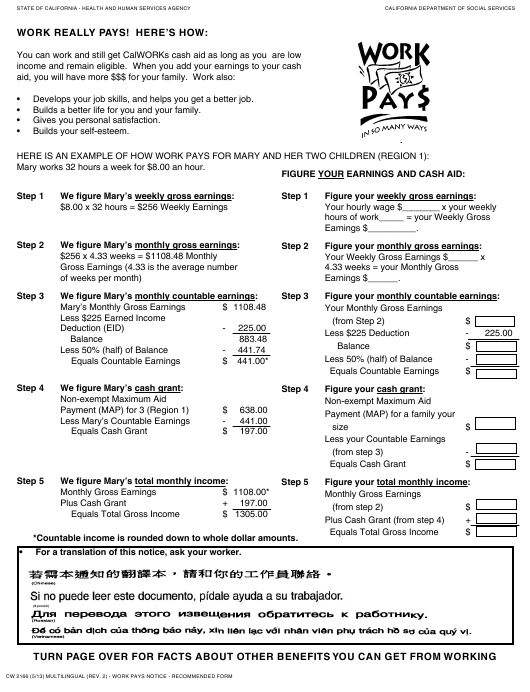 Form CW2166 or the "Work Pays Notice" is a form issued by the California Department of Social Services. Download a fillable PDF version of the Form CW2166 down below or find it on the California Department of Social Services Forms website. Develops your job skills, and helps you get a better job. Builds a better life for you and your family. Mary works 32 hours a week for $8.00 an hour. *Countable income is rounded down to whole dollar amounts. For a translation of this notice, ask your worker. do not owe any income tax. late penalty for those earlier years. the eligible child care provider that you choose. tax information, call the IRS at 1-800-829-1040.
paid child care for the entire time you are on cash aid. There are times when you can get aid past 48-months. former recipients, as part of the CalWORKs program. The limit does not apply to children. ✔ Age 60 or older. ✔ Disabled for 30 days or more. ✔ And other reasons your worker can tell you. Medi-Cal or Healthy Families programs.